Authentic mirin has the good taste inherent in glutinous rice extracted by "brewing," a traditional technique from ancient Japan. The more you chew boiled rice, the more you feel it is really sweet and tasty. However, the good taste you feel then is merely a small portion of the whole deliciousness of rice. In a couple of hours after you eat rice, rice starch turns to glucose and rice protein turns to amino acid. Only after that, these nutrients are absorbed into your body. Mirin contains the whole deliciousness of rice. The whole deliciousness of rice is extracted by brewing for over a year by dint of "malted rice." Mirin has the taste and delicacy of rice that you have never been aware of. Rice is perfect grain for Japanese weather and climate. It is cultivated throughout Japan from south end to north end. Rice is valued only as food, but it is more than that. Rice fields bring joy to you with their beautiful seasonal changes. Green rice paddies filled up with water under the scorching sun ease sudden climate changes and make your life comfortable. For this much environmental blessings of rice fields, how much ordinary citizens and the nation have borne the costs for preserving the environment? In the past, clean water and air had been available for no pay. Today, however, in many households, tap water is cleaned through expensive water filters attached to faucets, and air is cleaned through air purifiers set in rooms. People are no longer exposed to the sunshine. For example, UV-protecting cosmetics for women are abundant, and UV-blocking glass panes for vehicles and houses are prevailed. People are forced to bear the costs for worsening the natural environment. Japan has been rapidly industrialized with automation, streamlining, computerized and systematized. As a result, high-quality products are manufactured at low costs. In agriculture, however, how much productivity can be raised and how much cost can be cut down? If the day was longer, growth could go on. If farmland was made double- or triple-tiered, turnout could be made double or triple. The movement of the sun cannot be controlled. Plants will not grow with surface soil alone. They need ground water and sunshine, as well. Things are not so easy. Fertilizers are "nutritional supplements" used for expediting growth. Agricultural chemicals are used for protecting rich, tasty crops from pests. However, now that both fertilizers and agricultural chemicals have come to be avoided, it is difficult to raise the productivity and the yield. In highly industrialized Japan, it is extremely difficult to develop agriculture on the land in coexistence with industry. The government and the administration should change their way of approach to agriculture. The Ministry of Agriculture, Forestry and Fisheries and the Ministry of the Environment should work together on agricultural issues considering not only agricultural products as food but also CO2 absorption during their growth and various environmental effects. Consumers should buy agricultural products bearing the costs for preserving the environment because they live in the familiar country scenery. For the effects of environmental preservation and improvement thanks to agricultural production, the environmental contribution costs should be reflected in the agricultural product prices, and borne by consumers. In calculation, taking a bowl of boiled rice is equivalent to bearing the cost for keeping an armful of a rice paddy green. Therefore, everybody can readily contribute to the environmental sustentation and improvement by eating rice. I will widely spread the good taste of Japanese rice through "mirin" in order to contribute to the preservation and improvement of the environment. 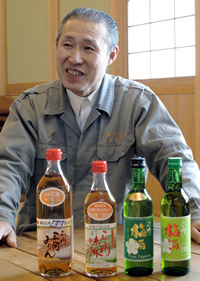 Sumiya Bunjiro Brewery　Co., Ltd.